The emergence of mosquito-borne diseases has triggered a demand for mosquito repellent candles across Europe, states the latest research report of Transparency Market Research. The growing possibility of malaria and dengue due to the constant inflow of travelers is expected to drive the demand for mosquito repellent candles across Europe during the forecast period. Furthermore, the benefits of these candles over other types of repellents such as liquids, coils, and ointments, have become their unique selling points, helping them carve a niche in the overall market. Candles do not emit harmful smoke or do not lead of dirt such as coils. Thus they are being preferred over conventional methods of repelling mosquitoes. According to Transparency Market Research, the opportunity in the Europe mosquito repellent candle market is expected to be worth US$2.0 bn by the end of 2021 as compared to US$1.3 bn in 2014. During the forecast years of 2015 and 2021, the overall market is expected to expand at a CAGR of 6.0%. This market will also gain momentum from the recent outbreak of Zika virus, which has urged governments across Europe to take serious measures to prevent an epidemic. Geographically, the Europe mosquito repellent candles market is segmented into countries such as France, Italy, Spain, Portugal, Hungary, and Rest of Europe. Of these France is anticipated to emerge as the leader, with the segment poised to progress at a CAGR of 6.30% between 2015 and 2021. Climate change is expected to a major reason for excessive breeding of mosquitoes in the near future, which is likely to increase the risk of mosquito-borne diseases in the near future. As this trend continues, it will bolster the demand for mosquito repellent candles market in France. Warm climate and a progressive rise in the number of tourists with each passing year has made France susceptible to mosquito-borne diseases. Its relatively vast territory as compared to other countries in the region has also contributed towards its rising stake in the overall market. Analysts state that the improving economic conditions in France will also fuel the demand for mosquito repellent candles, with citronella being the most popular choice of product amongst the rest. The various raw materials used for making mosquito repellent candles are citronella oil, andiroba oil, eucalyptus oil, and basil oil. Over the period of next six odd years, citronella oil will be the predominantly used oil as it is inherently a mosquito repellent. The abundance of lemongrass, the source of citronella, will also cater to the ongoing demand for citronella-based mosquito repellent candles in the near future. Furthermore, citronella candles are marginally cheaper than the other types of candles, a fact that has been boosting the demand for these candles over the past few years. The shifting consumer preference for citronella candles over other types of mosquito repellent candles is also likely to work in favor of this product segment. Some of the leading manufacturers of mosquito repellent candles across Europe are Gies-Kerzen GmbH, Bite Lite LLC , Yankee Candle Company, Diversam Comaral, Guangzhou Tiger Head Battery Group, and Coghlan’s Ltd. Manufacturers are trying to develop products that are completely natural to overcome restraints such as exposure to lead and carbon as candles burn. Product innovation such as conceal candles that will act as inhibitor instead of repellents will also prove critical in gaining a leading share in the overall market. The increasing focus of players on marketing tactics and advertising is encouraging the growth of the insect repellent market across Europe. According to the research report, the Europe market for insect repellents is estimated to reach a value of US$1.82 bn by the end of 2023. This market is likely to register a healthy 3.0% CAGR between 2015 and 2023. The research study on the Europe insect repellent market offers a comprehensive analysis and highlights the major aspects influencing the growth of the market. The key growth factors, barriers, and opportunities in the market have been presented in the research report in order to guide the prominent players in making appropriate and effective business decisions in the near future. In addition, a detailed study of the competitive landscape of the insect repellent market in Europe has been given in the scope of the report. The rising concern regarding the rising number of insect-borne diseases is one of the key factors expected to encourage the growth of the Europe insect repellent market in the next few years. In addition, the growing number of innovative products and the development of the distribution channels are anticipated to supplement the growth of the market. On the other hand, several stringent rules and regulations concerning the development of insect repellents are expected to restrict the growth of the Europe insect repellent market in the forecast period. Nevertheless, the use of natural products for manufacturing insect repellents is predicted to generate promising growth opportunities and benefit key players operating in the Europe market in the coming years. 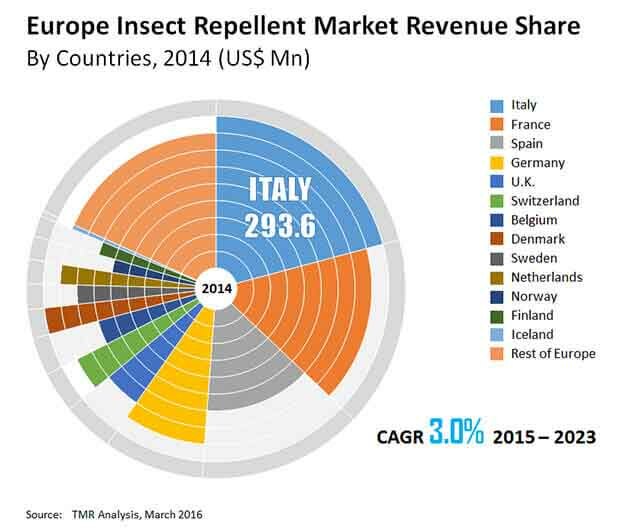 The Europe market for insect repellent market has been classified on the basis of geography in order to offer a detailed regional segmentation. Among the key nations of Europe, France is expected to register a progressive growth in the forecast period. As per the study, this segment is predicted to continue its dominance and attain a key share of the overall market. The rising demand for insect repellent market in this region can be attributed to the climatic changes and the increasing breeding of mosquitoes, resulting in a significant rise in the number of diseases. Furthermore, the rising awareness among consumers regarding the benefits of using insect repellents in order to get rid of different types of diseases is anticipated to accelerate the growth of the France insect repellent market in the next few years. The increasing number of initiatives by governments across Europe to eradicate several diseases and encourage a healthy living is predicted to contribute substantially towards the development of the overall market in the coming years. Some of the key players operating in the insect repellent market in Europe are BASF S.E, 3M Corporation, E.I. DuPont de Nemours and Company, Avon Products Inc., S.C. Johnson & Son, Inc., and Omega Pharma. Several new players are making efforts to enter the Europe insect repellent market and expand their product portfolio in order to create a niche and gain a competitive edge in the next few years. The key players in the market are emphasizing on product innovation in order to attract a large number of consumers across Europe. The development of an efficient distribution network is anticipated to encourage the growth of the insect repellent market in Europe throughout the forecast period. A thorough overview of the company profiles and the key strategies that are being used by them to sustain in the competitive environment have been discussed at length in the scope of the research report.